The strain of producing more than a hundred finished canvasses for the 1994 showing of Project 18 at the ICC in Birmingham exacerbated Lenkiewicz’s heart condition. He underwent heart by-pass surgery at St Bart’s Hospital in 1995. 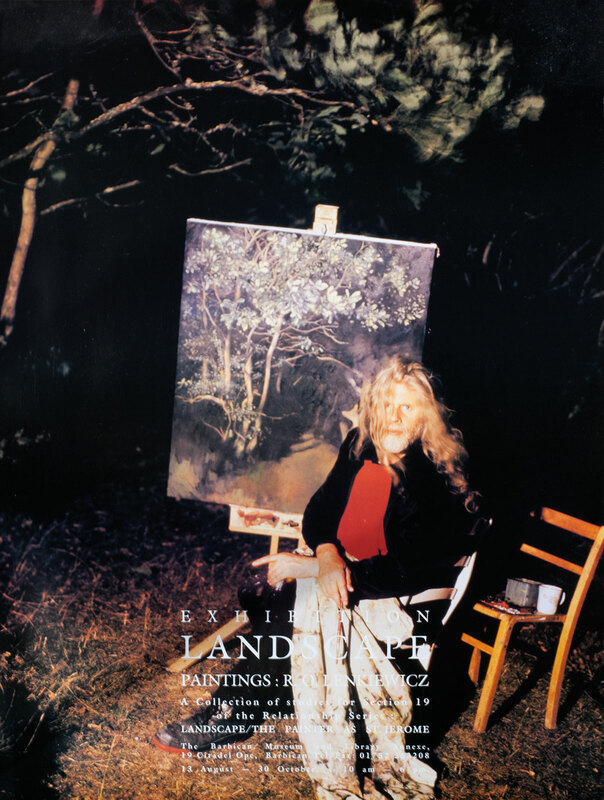 During his convalescence at the quiet Mudbank Lake Cottage on an estuary in south Devon, Lenkiewicz produced a modestly sized Project of fewer than forty pictures on the theme of Landscape – The Painter as St Jerome. Lenkiewicz had a youthful fascination with a painting by Flemish artist Joachim Patinir (c.1480-1524), Saint Jerome in a Rocky Landscape, which hung in the National Gallery collection. Renaissance images of St Jerome traversing desolate, stony landscapes, fording rivers or crossing mountain ranges presented the existential formula of “Man, lost, missing, in a terrifying infinity,” and indeed Lenkiewicz remarked that much of the work in the Project “related to feelings about isolation”. “Everything takes form, even infinity.” Bachelard. “A lake is the earth’s eye; looking into which the beholder measures the depth of his own nature.” Thoreau. In student days when Lenkiewicz visited The National Gallery, which was frequently, he was struck by the images of St. Jerome, and in particular a small panel by Patinir. From the early 17th Century images of St. Jerome had developed into theatrically lit excuses for recording sinewed, taut and wasted elderly men - almost an illustration for medical students studying anatomy, of cadaverous musculature. Before this phase however, St. Jerome would be hard to find, as he sat lost in a vast, stony and desolate landscape traversing rivers, forests and mountain peaks. The clear purpose of such imagery was existential; man lost, missing, in a terrifying infinity. Man insignificant. Images like these are the stuff of tragedy; late Michelangelo, late Goya, late Rothko. In future developments of this Project Lenkiewicz intends to expand the themes of Earth, Air, Fire and Water. Robert painting outside his studio in the winter of 1995. 5 Entrance to the Causeway. 7 St John’s wort with trees. 11 Moon over Lower Compton. 13 Painter by the Lake — 3.00 am. 15 Painter by the Lake — evening. 17 Trees by the Lake. 20 Estuary — early morning. 22 Lake — early morning. 23 Estuary — early morning. 24 Sun setting on Warren Woods — 9.30pm. 25 Painter at the hut — Shaugh Prior. 26 Painter by the Lake — early morning. 27 Lake — early evening.